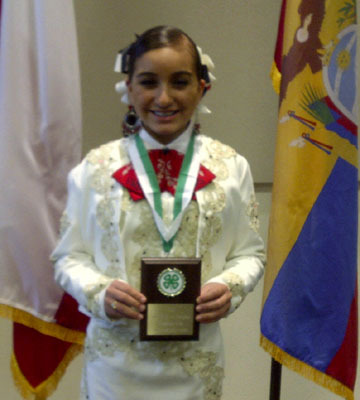 Sasha Guerra recently competed at the South District 12 4H Round-Up in Laredo, Texas with a Mariachi singing performance. Sasha won 1st place in the division and received sweepstakes honors in her age category. The Starr County 4H and Youth Development Program would like to congratulate Sasha for a job well done. For more information about the 4H program please contact the Texas AgriLife Extension Office in Starr County at (956) 487-2306.